Come see the thousands of historic and interesting firefighting items at the Kansas Firefighters Museum and Fallen Firefighters Memorial. 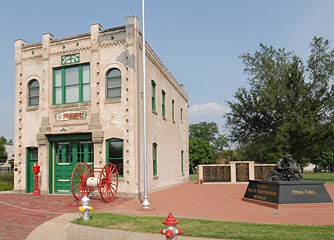 The Kansas Firefighters Museum is located in the old Engine House No. 6, built in 1909. Come see what being a firefighter was like in early Wichita! The Kansas Firefighters Museum has thousands of items on display from all over the state, including an 1800's hand-drawn hose reel, hand-drawn chemical exhtinguisher, and an 1880's Howe handpumper. A handpumper is a pump for water that was operated by men pulling on handles on either side of the tank, not like today's tanker trucks, which are motorized. We also have on display a 1923 Ford Model-T and a 1928 Model-A set of firetrucks. There are helmets, uniforms, badges, caps, wooden water mains, hydrants, nozzles, alarms, leather buckets, ladders, axes, sirens, photographs and so much more to see. On the first floor, visit our gift shop, buy an engraved brick, have your photograph taken on the steam pumper or ring the firebell. Upstairs you can see our collections of historic firefighting items which cover the walls from floor to ceiling. You can see the kinds of beds firefighters in Engine House No. 6 used to sleep in, and look down the brass fire pole hole. It's a terrific place to see some rare firefighting items and things you may have never seen before. Admission is $3.00 for adults, $2.50 for seniors, $2.00 for students and kids under 5 years of age are free. Guided tours are often available; just ask! Also, be sure to ask us about our expansion project, which will add display space and allow us to bring in additional, larger firetrucks and equipment. The Kansas Fallen Firefighters Memorial is dedicated to those Kansas firefighters known to have died in the line of duty. It is located just south of the Kansas Firefighters Museum, 1300 S. Broadway, Wichita, Kansas. The museum and memorial are situated on the northwest corner of Lincoln Park and across the street from a modern fire station. The winged memorial wall is located just south of the Kansas Firefighters Museum and holds the names of firefighters who have died in the line of duty in Kansas. The names are engraved in black granite and have the fire department and date of death. Get Your Firefighters Calendar Here!